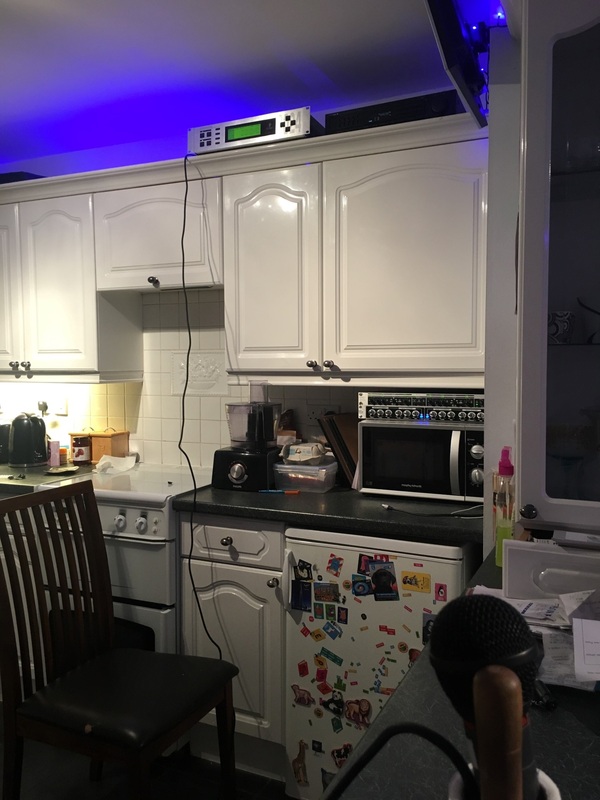 This article details my kitchen audio system which is cobbled together from a bunch of apparatus I’ve acquired over the last 20 years, none of which was intended for this purpose. The resulting sound from a mere 220W has to be heard – and felt – to be believed. Read on for a detailed missive on how the assembly of a bunch of junk from the 90s transforms into a home audio system I’m proud of. The Kitchen Is The Heart Of The Home. Quite what this means is open to interpretation, but our kitchen diner is where so much of the interaction happens. It’s where we come together at the beginning and end of every day, and crucially it is where we eat, drink and entertain. Cooking, baking and cocktail making are all significant areas of interest for us. We hope our guests enjoy coming over, whether for a relatively civilised dinner, or one of those epic parties which no one can remember leaving, involving smoke machines and lasers; the parties that leave the floor super sticky and showered in smashed glass. Yes, those. So whether the girls are spending the afternoon baking, or I’m creating a classic curry for diner; whether we’ve got a couple of friends around for dinner, or it’s a full on cocktail party, there’s one thing our kitchen needs: music. I believe music is one of life’s key ingredients (curry and oversteer are the others), and I’m fussy about sound production quality, both in the recording and reproduction stages. My work bio states that I “enjoy innovative, welcoming hospitality, and won’t tolerate a nasty sound system”, and in my youth I used to run a little disco company with my friend Ben. Here’s a photo from about 2002 – vintage! So given all this background I was never going to be satisfied with an iPhone speaker as the kitchen’s music source. Or an Alexa. Or a Sonos thing. Sound bar blah blah nonsense. No point source of music is going to be okay, and we aren’t going to spend thousands on this either. I don’t think decent audio needs to be that expensive, so let’s go back to basis. I’m a firm believer in having music fill the room evenly. It should be possible to talk easily over a solid musical base that fills the audio void when there’s no conversation. This cannot be achieved from a point source. Even lower frequencies need to have more than a single source in larger rooms. Mid-high frequencies require a speaker in each corner, and they need to be up high so that bodies and furniture don’t absorb or unevenly reflect the sound. Our kitchen diner is 3m wide, 7m long, and 2.3m high. It would therefore need a speaker in each corner, and a sub at each end. We don’t want huge speakers on the wall, so standard issue home cinema satellite speakers are a good bet. Kitchens don’t lend themselves to popping a sub in a corner. I had tried operating with just a sub at the dining room end, and that meant it was either gutless in the kitchen, or overpowering in the dining area. If I ever get a new kitchen I’ll be looking to provision dedicated sub space somewhere, but for now I had to find some way of putting a sub somewhere that wasn’t too intrusive. It is essential to run two-way. Most subs will filter high frequencies out to avoid weird booming mid range, but small satellite speakers need protection from lower frequencies. Standard home cinema amplifiers will do this. I wanted to be able to select from two sources: a 3.5mm trailing cable, and the phono link lead from my office. That’s a two way stereo link lead, allowing audio from the office to be piped to the kitchen, and vice-versa. 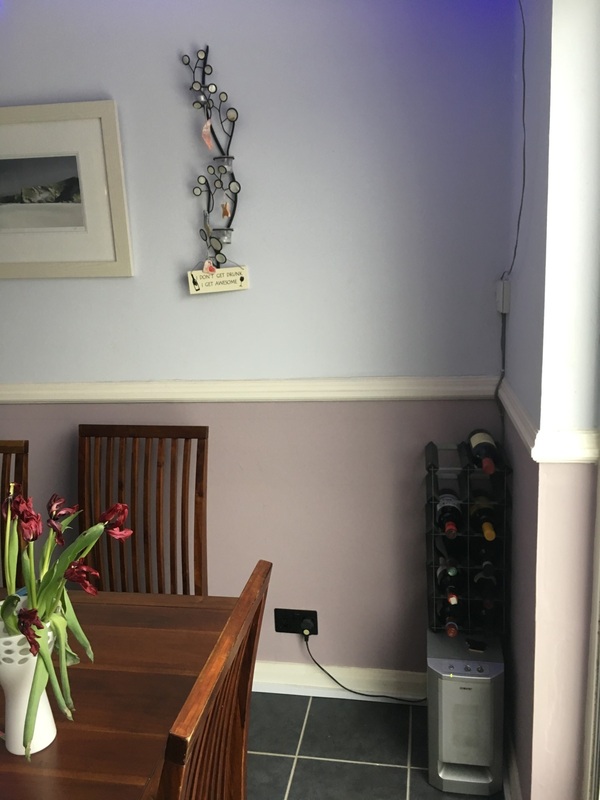 I should also note that geographically the living room is between the kitchen and the office, where there’s a junction in the cables that allows the living room to select between the kitchen and the office as audio sources, in addition to the TV. In order to get the system sounding as I want it (which isn’t entirely flat), I want a graphic equaliser, parametric filters, and a sonic exciter. 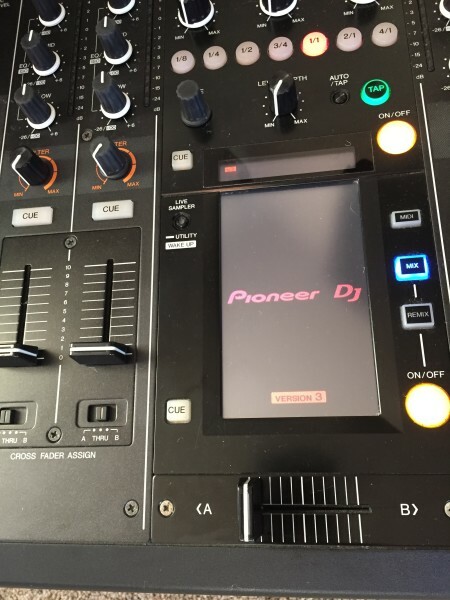 I want one power button to turn the whole lot on and off, one volume control, and easy access to the sonic exciter and audio balance levels so I can adjust for different genres and production methods. About 15 years ago, my friend Paul Cooper gave me his old Sony 5.1 system for use in my old house. From there it went to my office, where after many years of good service the receiver died, leaving me with the satellite speakers and the sub. When I moved in to my current house in 2009, just as a rudimentary quick fix for the summer, my friend Robin and I popped those speakers on the wall and the sub on the floor. It was a crude installation intended to be replaced by Christmas. We shoved a full range signal into them from an old Kenwood amplifier because that would do as a temporary measure. Naturally they are still there, and provide the mid-top for this system. So here they are at the dining room end. 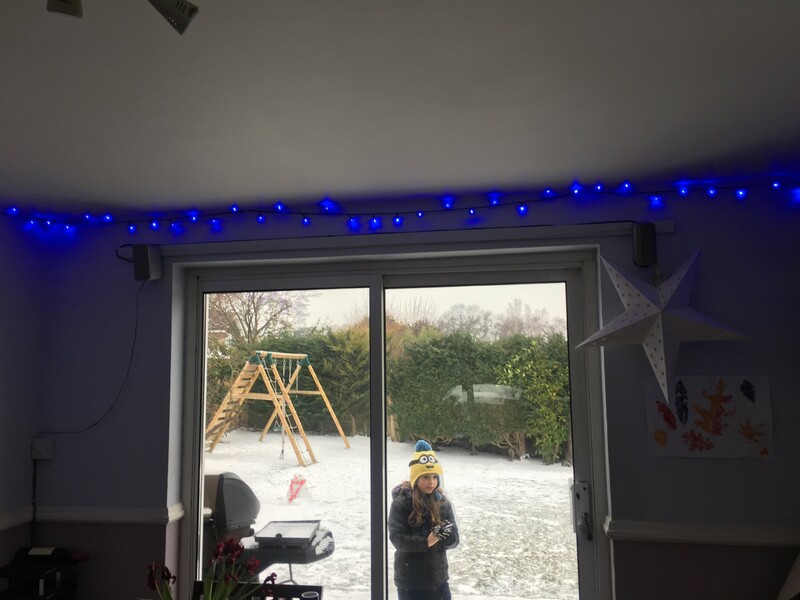 Yes, we leave those fairy lights up all year round. Yes, that droopy cable has been there for nearly 9 years. One day I might sort that out. And here’s the sub (Sony SA-WMS225), nestling under the wine rack there. The wine bottles don’t rattle amazingly. The rack is attached to the wall with a screw to keep it in place, but the sub bears the weight of the rack. At the kitchen end I managed to source a sub (Yamaha SW-P13D) just slim enough to pop up above the cabinets. It is more obvious than I’d like, but fundamentally it is out of the way. So that’s the speaker situation. Two active 50W subs each loaded with a 6.5″ driver, and four 25 year old satellite speakers that will enjoy 30W apiece. I’ve already listed my criteria for the amplifier, and I don’t know if anything exists that would satisfy everything there. I did however have a Kenwood KR-A5010 I found on eBay a couple of years ago for about £30, so that would have to do. These older amplifiers have a brilliant feature that they usually refer to as a Tape Loop. There’s a pre-amplified phono output after the input selector, and also a return. This means I can use the main input selectors (CD for 3.5mm trailing lead, and Tape for the input from the office), and that will be pre-amplified and then fed out through all my signal processing, and back into the amplifier. So I can use its input switches, and its amplifier stage for the mid-top speakers; my signal processing will remove the bass component of this audio. It also has a switched and fused power output, which I’ve converted to be a trailing C13 IEC. None of this was earthed from the factory so I replaced the input lead and added an earth to the switched output. It is nearly perfect, but because it doesn’t naturally filter bass frequencies from its speaker output, and because it does not have a sub-woofer output, it is necessary to use a dedicated active crossover and, sadly, it isn’t possible to use the amplifier’s volume control for the whole system. 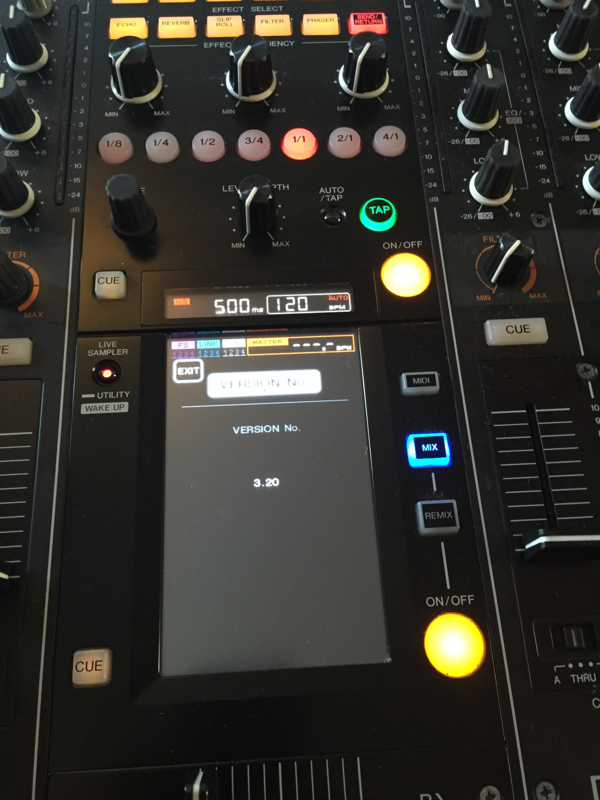 Indeed the volume control shouldn’t be touched, as it effectively controls the bass to mid/top volume difference. 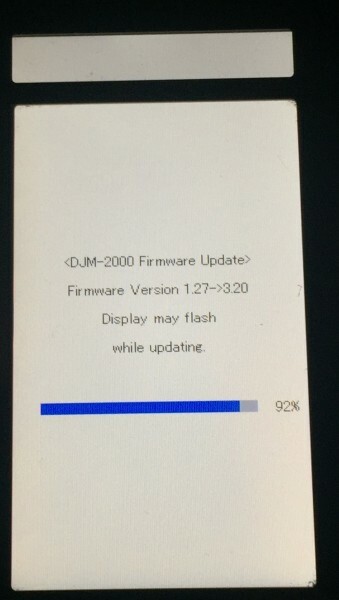 This isn’t as bad as first seems though, as the nature of the sources means that a phone is probably controlling the master volume; either directly if the phone is the music source, or indirectly as phones will remote control the computers in the office if they are the source. The crossover presents volume controls offering +/- 12dB which is a useful alternative. So the Kenwood nestles on top of the kitchen cupboards, like so. There are only three signal processing items in the loop. 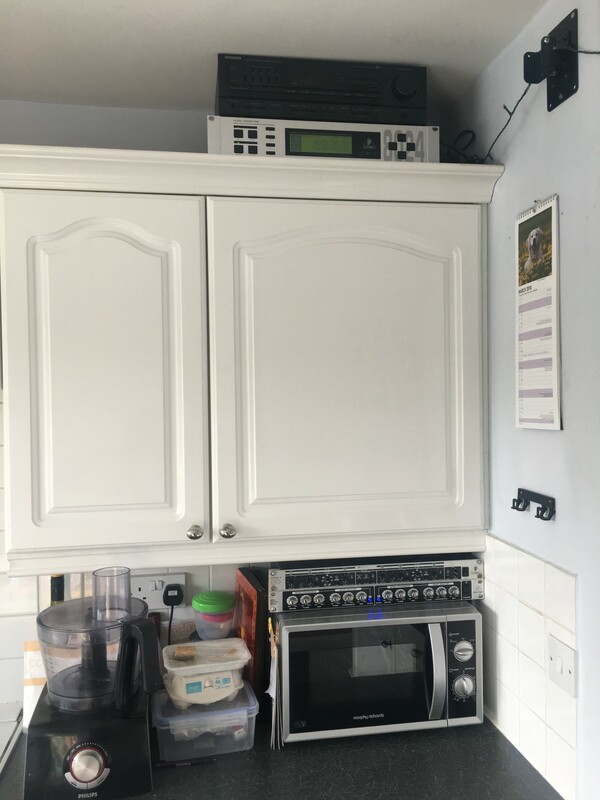 I’d have added some compressor limiters but, for reasons I cannot fathom, my kitchen was not designed with a built in 6U 19″ rack for signal processing. What were they thinking? The first stop in the loop is a Behringer Ultra-Curve Pro DSP 8024. These are available for about £50 on eBay at the moment. It comes with 6 parametric filters, plus the standard 31 band graphic equaliser. Once set up the settings can be stored in memory, and so I’ve tucked it up out of the way on top of the cupboard. It also has a very useful RTA with microphone input, which I’ll cover later. There are better sounding digital graphic equalisers, but there are worse too. 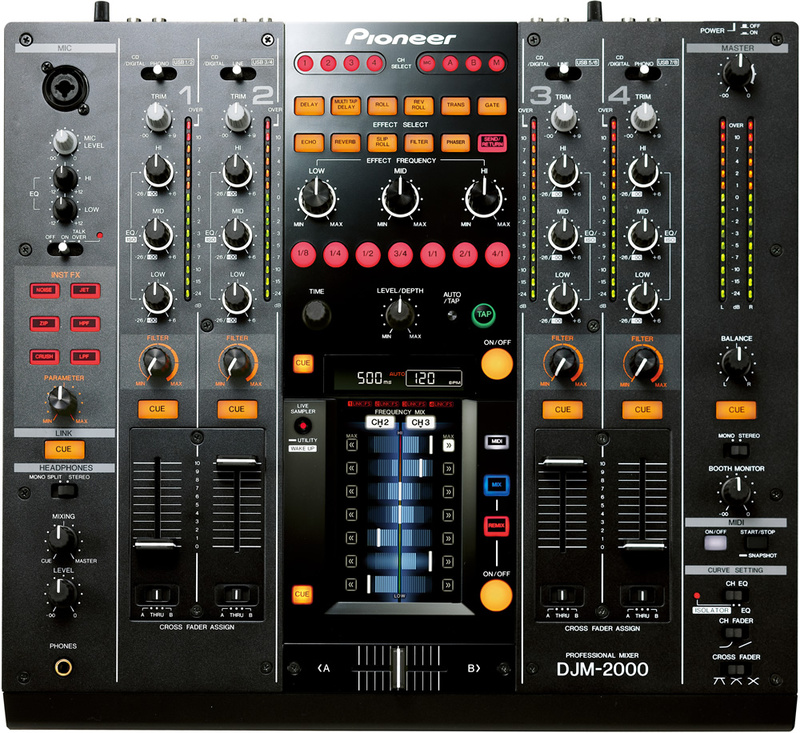 I’d avoid the similar Pro DSP 8000 model, as it only has a 20-bit DAC which is noticable at times. I have one of those in the garage and it’s alright, but I’d recommend grabbing an 8024 if you can. 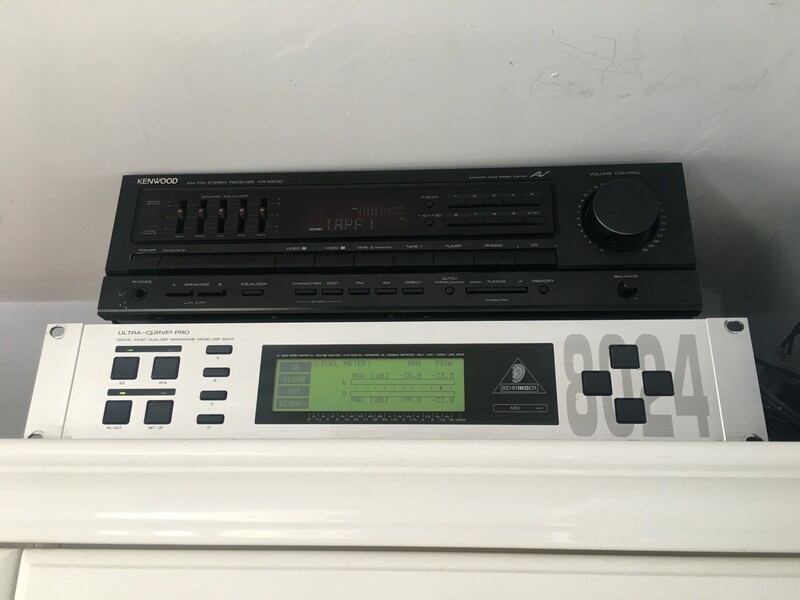 The second stop in the signal processing loop is a Behringer SX3040 sonic exciter. These are actually currently available new for about £84. If you can find one, I’d recommend a Behringer Dualfex II instead. I’ve got one in my office and it sounds really good, so I chose to leave it there. They are expensive though as they are quite rare now, so it is probably more economically viable to buy an SX3040 new. If you aren’t familiar with the benefits of a sonic exciter, get yourself a good set of headphones or a proper sound system, and settle down to this informative video. 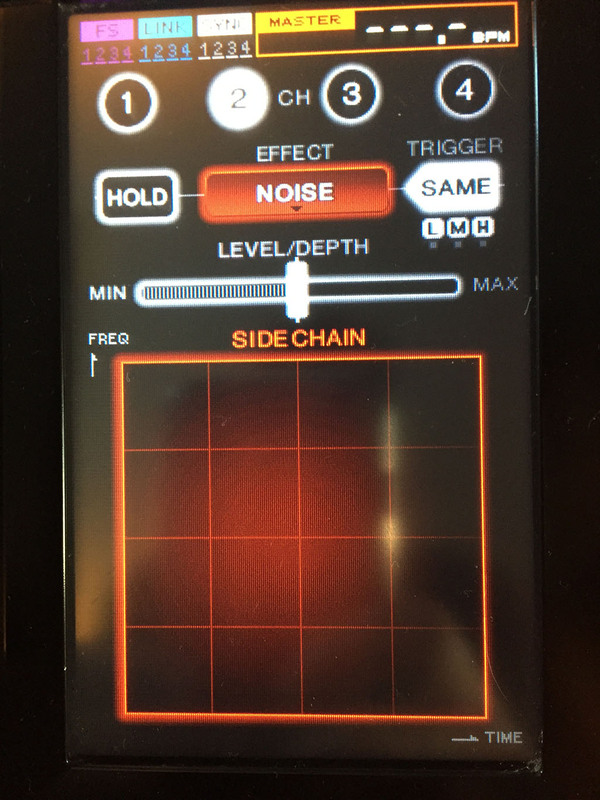 At one point in that video he lowers the bass tune control to the minimum so the unit is only boosting really low bass, which is exactly how I use mine. It gives kick drums real presence, and means the system really feels in charge of the room. The final stop on the signal processing loop is a Behringer Super X CX2300 active crossover. It takes a stereo signal and splits out the bass from the mid/top in each channel. I’ve chosen to crossover at 120Hz. This saves the satellite speakers from a huge amount of bass energy, allowing them to focus on what they’re good at. There’s a current version of the Super X which is available new for about £75. The bass outputs from the Super X go directly to each sub, and the mid/high outputs return back to the Kenwood’s Tape Loop return. 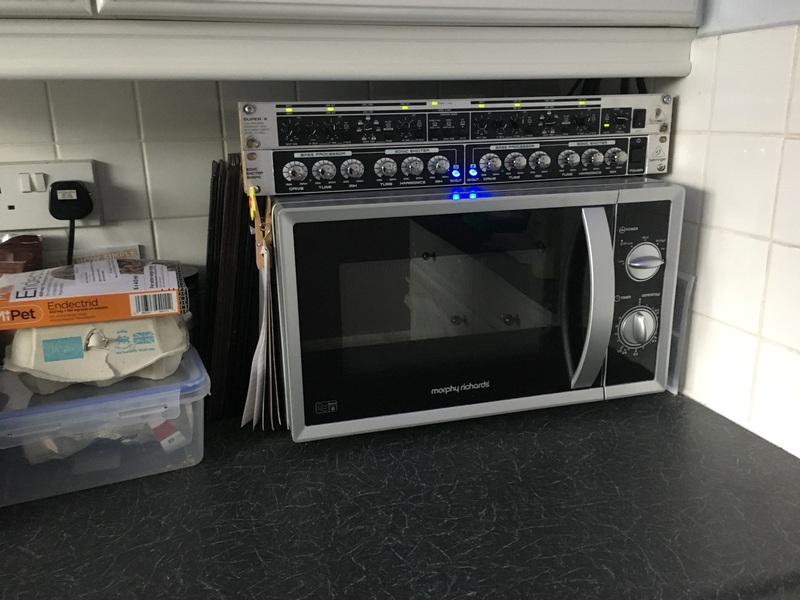 As you can see above, I’ve nestled the sonic exciter and crossover above the microwave. This gives me a good amount of control at a useful level. I had to make a bunch of cables up to fit down the side of the cupboard there, including sending a power cable down so that the Kenwood’s power switch operates the lot. As mentioned, the UltraCurve has a really useful Real Time Analyser (RTA) with pink noise generator and microphone input. This means you can wedge a microphone in your kitchen roll holder, add a typical amount of sonic excitement, and see the result on-screen. The resulting curve with the exciter engaged, but no graphic equaliser. This was interesting. 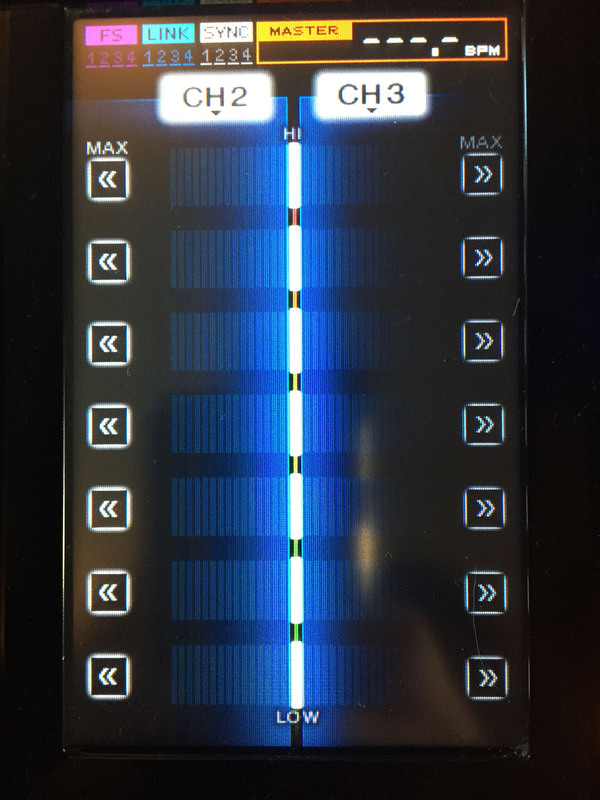 I clearly couldn’t trust my microphone at the extremes of the frequency range, but it did show a significant dip at 400Hz to 800Hz which explained a lack of mid-range. I used the parametric filters and equaliser to put this back in, and to shave the peaks in the 1kHz to 5kHz range. 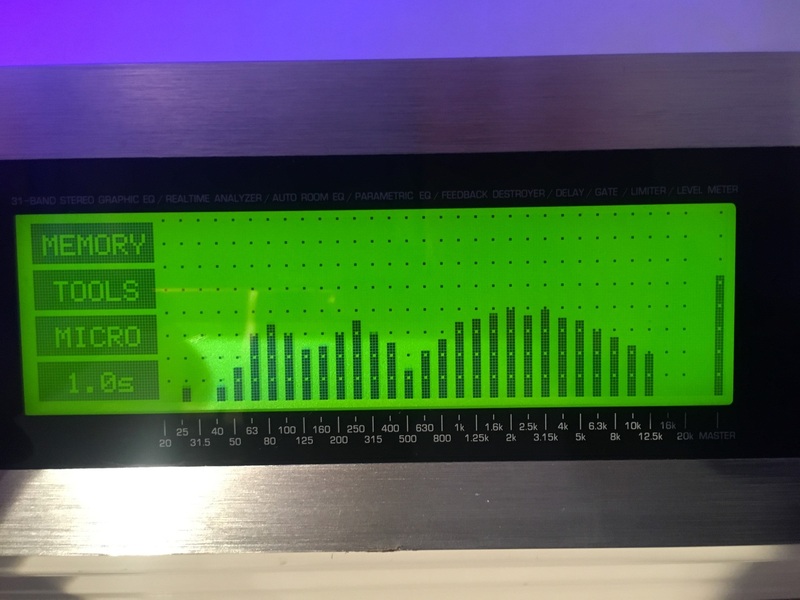 Then added some sparkle at the top, suppressed that 80Hz spike, and gave a good dollop of shove in my favourite 40Hz to 50Hz range down the bottom. The result quite deliberately isn’t flat, but it is what I wanted. Lots of grunt down the bottom, without any booming from kick drums, and some lovely sparkle right at the top. That emphasis on the range gives the system significant presence that sets it apart from humdrum, more ordinary noise-making machines. I’ve left a slight dip in the mid-range for social etiquette reasons – I don’t want people to struggle to communicate over my music. By leaving the mid-range just a couple of db below natural, it makes chatting much easier over background noise. The brain doesn’t notice so much musical content missing because the spectral enhancer adds in associated harmonics further up the range. The result of all this is, yes, a little bit of clutter in the kitchen. Most people would consider it overkill. I’ve a passion for music, and a passion for being in the kitchen; so for me this is entirely sensible. To reduce clutter the Ultra-Curve and Super X could be combined into a single unit with a BSS Mini-Drive or similar, and that would add compression-limiting too. I’ve got one I could have used, but it doesn’t have such easy to access volume controls, and it doesn’t look as nice at the Behringer gear IMO. 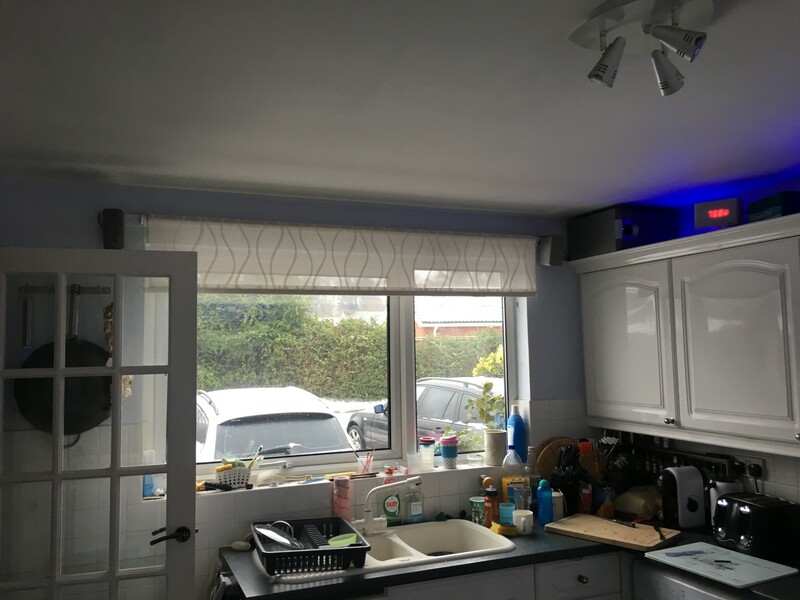 So now the house has a bit of a party piece: a sound system in the kitchen diner that’s great for unobtrusive background music, but is also capable of flapping your trousers and rattling the glasses and bottles on shelves while maintaining excellent acoustic clarity. The last six months or so have seen me getting back into sound system and light show engineering. I emerged from school as a bit of a DJ with the requisite tools and a basic sound system, and while my primary profession turned out to be software engineering, I continued to grow my sound system and complemented it with a bit of lighting. At its peak, in around 2003, the sound system looked a little bit like this. I was also much thinner, as you can see. 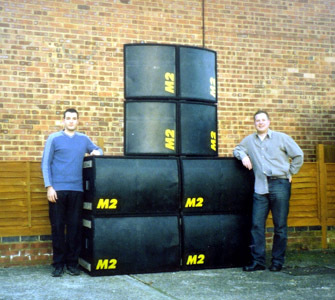 I actually built another couple of these bass bins for the more demanding drum and bass events we did. It was a nice little system. Around half that lot stacked up smartly enough for corporate functions, and the whole lot made a reasonable impression on Guildford’s old Civic Hall. In the ten years since much has changed. In 2006 I sold all those speakers, my amplifiers and my lights. I put the money towards kicking off the E30 M3 project which established readers will know all about. This rise and fall of interest coincided with that of a good friend of mine. Jon Evelegh, a school friend at first, had built up a rather larger sound system, and sold it as his primary interest turned out to be marine towage. So after his departure from the scene in 2002, and my complete sell-out in 2006, my world became a much quieter place. Recently however, that situation has been completely reversed. In 2010 Jon re-acquired his system. Having overhauled it completely, and greatly increased its size, he’s ready for business. His system is custom built, unique, and devastatingly good in a way that’s very hard to quantify. 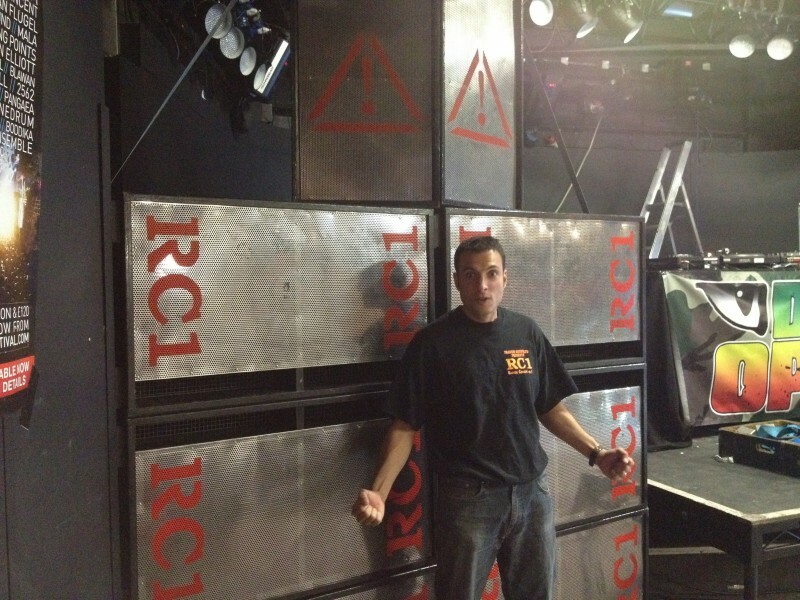 On the date of this article, Jon’s RC1 Sound System has 1,132 Facebook likes. That’s an awful lot of people, many of whom are big name DJs, who follow his movements and just want to know more. Last May, Jon asked me to come along to a gig he was doing down in Bournemouth. He was putting a 16 box system in a nightclub called The Old Firestation for a night called Dub Optic. It was at this point I realised how much he had moved the game on. 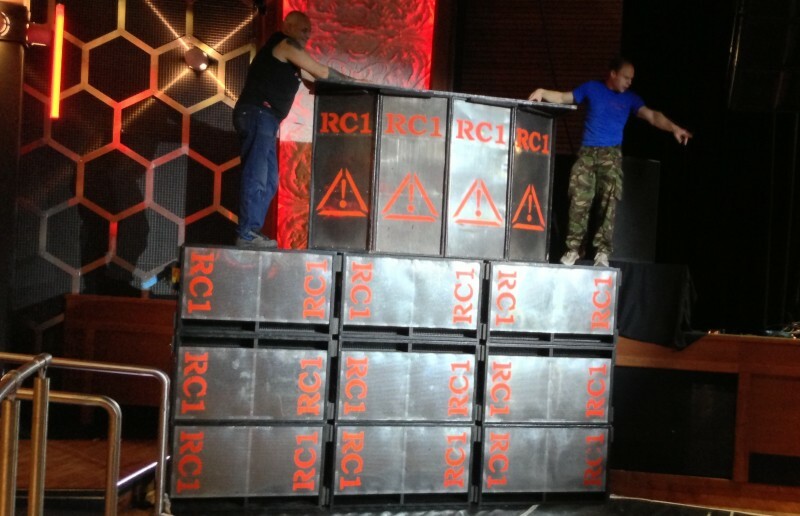 For a start, when I had a 10 box M2 system, Jon had a 12 box RC1 system. The RC1s were already considerably louder and generally more capable. Yet here he was wandering around with a 16 box system. Here’s a picture of me in front of a stack. Bass at head height! The sound was incredible. Not just powerful, but so musical and such high quality. I left that night knowing I’d just got the bug again. Which brings us in a long, rambling way back to the present. I’m very excited by sound and light engineering again. I’ve built up another small sound system and a much larger light and laser show designed to accompany the RC1s on their journey to stardom. I’ll blog about my light and sound separately. I’ll probably blog more about RC1 in the future too come to think about it! I’ll sign off though with a picture of Jon atop one of his 13 box speaker stacks at the London O2’s IndigO2 bar just before Christmas. That was quite the gig!